I was invited, courtesy of our music editor Gary Kahn, to Trinity College, Oxford, for a tour of the Old Library – which, apparently, has even its own ghost: John Henry Newman. The place is rich with literary associations – Dr Johnson, for example, used to study there. 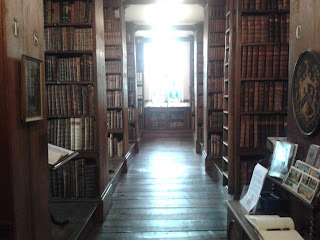 There are hundreds of fabulous books there, and I'd have been happy to be locked in for a week or two so that I could browse them at leisure. 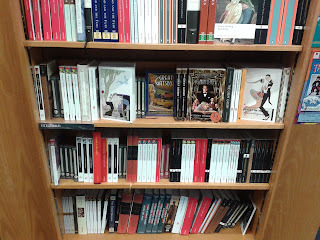 The section I liked the most was the first-editions one. 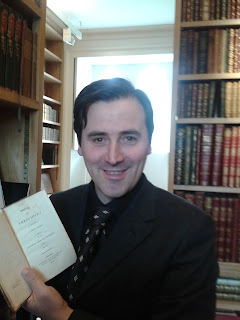 Here I am holding the first volume of the first edition of Pride and Prejudice, first published 200 years ago, in 1813. But for me the real gems were the first editions of Milton's Paradise Lost, George Eliot's Middlemarch (four green volumes, left in the following picture) and Fielding's Tom Jones (six brown volumes, right). Thanks to Sharon, the Librarian, for showing us around. 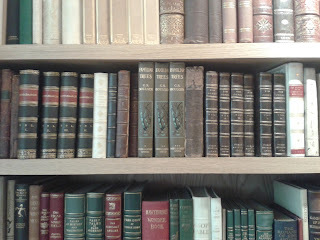 A short stroll from Trinity is the Blackwell's bookshop in Broad Street. Alma is well represented throughout, and there's plenty of beautiful modern books on display, including the six titles from our splendid Fitzgerald series. No trace of ebooks there, thank God. The physical book is still going strong in Oxford, even among students.